Dates roll with dry fruits is one of the easiest sweets to make! 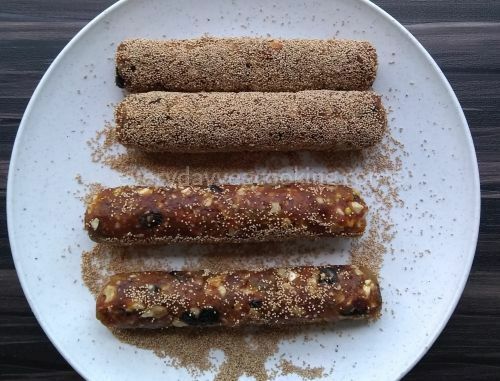 This dish is naturally sweet and everyone can enjoy eating these mouth-watering dates roll without guilt because additional sugar and ghee are not required in making this sweet. Dates roll is a healthy and nutritious sweet. 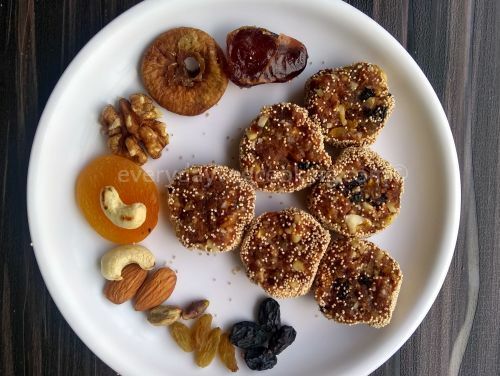 The best part of this rolls is that you can add your favourite dry fruits to it and you can increase or decrease the quantity and variety of dry fruits as per your choice. There are immense health benefits of eating dry fruits. 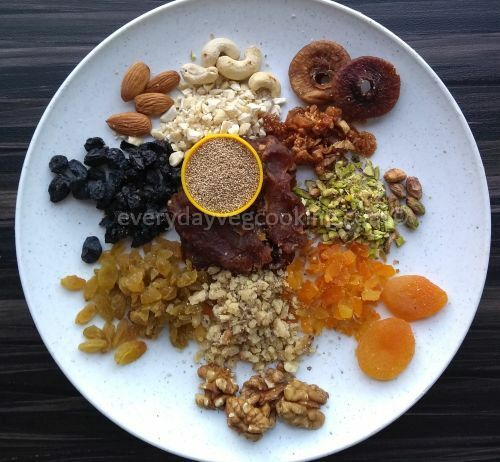 Especially in the winter, dry fruits keep our bodies warm and protects us from many diseases. Dates rolls which are loaded with our favourite dry fruits are perfect snacking in the winter season. My recipe of dates roll is very easy, and there’s no cooking required. I have just roasted nuts and then combined everything together and rolled it with poppy seeds. Dates roll have long shelf life so we can make it in advance for festive celebration. Dry roast cashew nuts, almonds, pistachios, and walnuts until they are warm. Coarsely crush all the nuts. On low flame, dry roast poppy seeds until they are light golden in colour. Transfer poppy seeds onto a plate. Except for poppy seeds, take all the ingredients in a separate plate. Combine everything with hands and mold the mixture like a ball. Now divide it into 3 to 4 parts. Spread poppy seeds in a plate and roll all the logs in it. Make sure that poppy seeds coat them properly. Now keep these rolls in the refrigerator for 1 to 2 hours. Take out rolls from the refrigerator and cut into equal size slices. Dates rolls, rolled in poppy seeds look very attractive! Store dates roll in an airtight container.